Former deputy prime minister Tony Tan was sworn in as Singapore’s new president on September 1 after narrowly defeating his closest competitor in a four-candidate race in late August. Despite the support of prime minister Lee Hsien Loong as well as several ministers and trade unions, Tan only won 35.19% of the total vote. Another former lawmaker, Tan Cheng Block, received 34.85%. 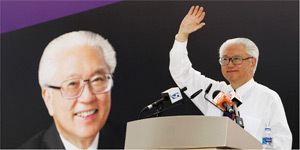 While Tony Tan officially ran as an independent, he was widely perceived as the favorite of the ruling People’s Action Party (PAP). “The election came soon after the May 2011 general election, which saw the ruling party returned to power once again, but with only 60.1% of the popular vote, underlining apparent voter dissatisfaction with the party,” explains Maria Patrikainen, South Asia analyst at IHS Global Insight. The low share of the popular vote, by historical standards, led to the resignation of Singapore’s founding father Lee Kuan Yew from his cabinet position. The office of president has traditionally been a symbolic one, with limited legal powers. However, the three losing candidates pledged to be more active, serving as a check on the powers of the PAP-dominated parliament. The public support they received cast doubt on the perceived effectiveness of the PAP’s response to key social issues. Immigration is chief among these issues. The Singaporean government has encouraged skilled foreign workers to emigrate, which has in turn increased competition for jobs and pushed up prices, especially for housing. Greater Internet access has also loosened the government’s control of information, opening channels for citizens to express opposing viewpoints. The presidential candidates utilized the Internet to build support during the election run-up.